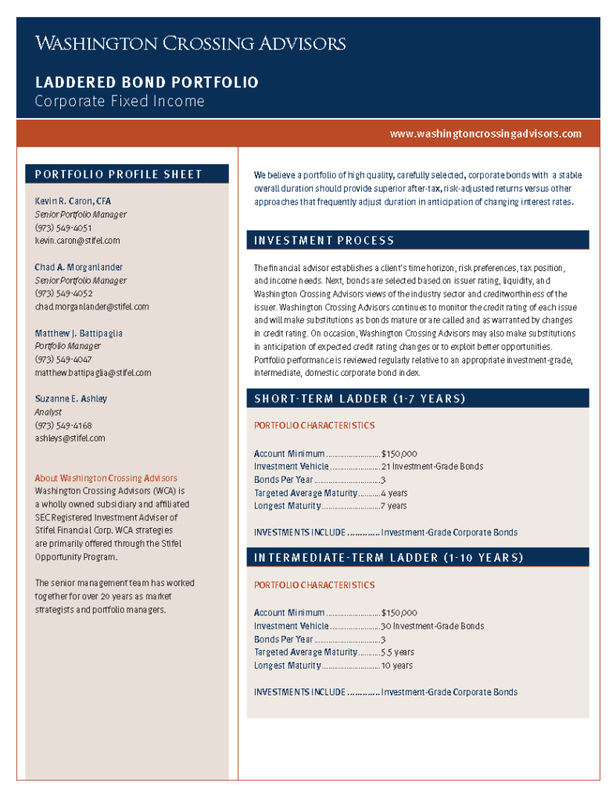 This portfolio seeks to generate a stream of income from a portfolio of 30 carefully chosen investment-grade corporate bonds. We construct each portfolio like a “ladder” with maturity “rungs” ranging from 1 to 10 years. Three bonds, or about 10% of the portfolio’s holdings, are expected to mature each year. The principal from each maturing issue gets reinvested in new, typically higher-yielding, 10-year bonds. Another feature is the relatively stable 5-6 year average maturity of the portfolio, which can help control risk and improve tax efficiency versus higher turnover strategies. We continually monitor holdings with an eye toward maintaining portfolio credit quality objectives. This portfolio seeks to generate a stream of income from a portfolio of 21 carefully chosen investment-grade corporate bonds. We construct each portfolio like a “ladder” with maturity “rungs” ranging from 1 to 7 years. Three bonds, or about 15% of the portfolio’s holdings, are expected to mature each year. The principal from each maturing issue gets reinvested in new, typically higher-yielding, 7-year bonds. Another feature is the relatively stable 4-year approximate average maturity of the portfolio, which can help control risk and improve tax efficiency versus higher turnover strategies. We continually monitor holdings with an eye toward maintaining portfolio credit quality objectives.